Balladeer’s Blog offers one last round of congratulations to the 2017 college basketball champions in the FOURTEEN divisions covered here. Silver John: Can These Bones Live? I’m still a fan of Manly Wade Wellman’s pulp hero Silver John, the roaming singer and guitarist who fights supernatural forces in the Appalachian Mountains of long ago, sort of like a countrified Orpheus meets Kolchak. He’s called Silver John because of the silver strings on his guitar and the silver coins he carries in his pockets. 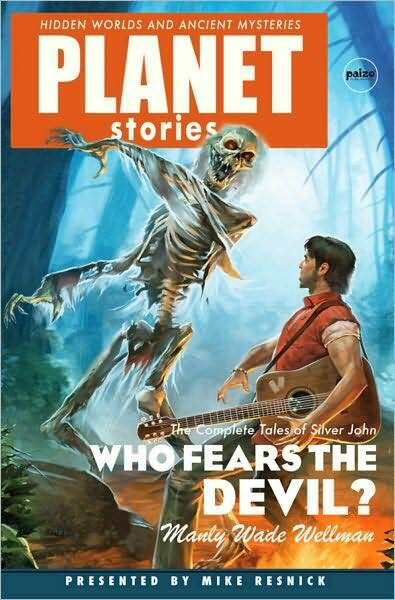 NOBODY EVER GOES THERE – Just a reminder that all the Silver John stories published after his marriage to his beloved Evadare (click here if you missed the tales chronicling that landmark event – https://glitternight.com/2011/06/03/pulp-heroes-silver-john-four-for-friday/ ) jump around in time. This short story is set when John is much older. Plus the tale breaks from the tradition of having the stories narrated by Silver John in the first person. We get a third person narrative in which the older (probably 40s) balladeer comes to the aid of two young lovers in the town of Trimble. THIS IS ALWAYS THE ASPECT OF MUSLIM IMMIGRATION THAT GETS IGNORED. IT IS NOT REACTIONARY MUSLIMS ALONE WHO CAUSE THE PROBLEMS BUT THE POLITICAL PARTIES WHO ENCOURAGE ALL OF THE WORST ELEMENTS OF ISLAM. This toxic blend of Muslim fanatics and people who pretend to be Liberals always winds up resulting in the silencing of peaceful, civil Muslims and the elevation of violent Muslim fascists. At any rate here are some excerpts from Hungary’s Viktor Orban regarding the way the political powers that be keep ramming large-scale Muslim immigration down the throats of the public. All while never expecting other, oil-rich Muslim nations to take in any of these “refugees” who are actually fit young men for the most part. “The main danger to Europe’s future does not come from those who want to come here, but from Brussels’ fanatical internationalism. We should not allow Brussels to place itself above the law. We shall not allow it to force upon us the bitter fruit of its cosmopolitan immigration policy. The Tale: Baal, the storm god of the Canaanites, had emerged triumphant in his war with the sea god Yam and became very hubristic. He insisted he had authority even over Mot, the god of death and warned Mot that the only places on Earth that he could visit were the deserts. Infuriated, Mot invited/ dared Baal to visit him in his subterranean realm, the land of the dead. Baal accepted the dare/ invitation lest he lose face and once there Mot fed him the food of the dead – mud – thereby trapping Baal in the Netherworld. With Baal thus imprisoned no rains fell on the Earth and drought consumed the world, killing vegetation and the animals who fed on that vegetation, then the animals who fed on THOSE animals, etc. So now we learn that yet again America’s unhinged corporate media and corrupt political establishment played a cutesy word game to pretend that United States President Donald Trump was wrong about something he was actually correct about. Remember when the media tried acting like President Trump was wrong about the Muslim situation in Sweden? And the Boeing situation? Also, remember last year when a Muslim fascist used a makeshift explosive in New York City and Trump called it “a bomb” but our insane corporate media acted like Trump was “wrong” and “irresponsible” because they felt such a cobbled-together explosive device should not have been referred to as “a bomb.” I could go on and on with other examples but we’ve all lived through them once already. Well it turns out that President Trump was right about Obama and his fellow criminals bugging him but, Comey and others tried discrediting President Trump by playing the kind of word game that Mafiosi play on the witness stand. Trump’s foes in America’s 3rd World Level swamp of corruption pretended that since the word “wiretap” no longer technically describes the type of electronic surveillance that Obama and our “intelligence community” thugs were subjecting President Trump to, that they were being “truthful” when they claimed there was no evidence of wiretapping. IN OTHER WORDS TRUMP WAS RIGHT AGAIN BUT HIS FOES IN BOTH POLITICAL PARTIES WERE ONCE AGAIN GIVING DECEPTIVE ANSWERS. CHAMPIONSHIP GAME – The 2nd seeded NORTHWEST MISSOURI STATE BEARCATS took on D2’s last surviving 1 seed – the FAIRMONT STATE FALCONS – for the championship.